There is a nutrient gap in America because many of our families are filling up on empty calories instead of essential nutrients. In fact, more than 9 out of 10 Americans aren’t getting the essential nutrients they need. The nutrients in milk can help fill that gap. Low-fat milk is an excellent source of calcium, vitamin D, riboflavin and phosphorus, and a good source of protein, potassium, vitamin A, vitamin B12 and niacin. But with water, juices and nutrient-void sodas on the shelves, American families (and kids in particular) might not be drinking as much milk as you think. In fact, recent research suggests that only kids ages 1-3 are actually meeting their recommended daily servings (Kranz S, et al. J Pediatr. 2007;151:646-646.). According to Moshfegh A, et al. (U.S. Department of Agriculture, Agricultural Research Service. 2005. ), 9 out of 10 teen girls and 7 out of 10 teen boys don’t get the calcium they need. According to Bailey RL, et al. (J of Nutr. 2010; 140: 817-822. ), 7 out of 10 teen girls fall short in vitamin D intake. According to Moshfegh A, et al, 2005, 97% of Americans don’t get the potassium they need. Low-fat flavored milk helps families and children make a nutritious beverage choice. Data show that kids choose flavored milk 70% of the time. 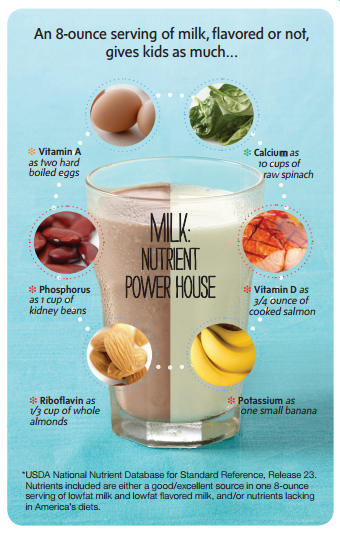 The nation’s leading health and nutrition organizations and the Dietary Guidelines for Americans recognize the valuable role that milk, including flavored milk, can play in meeting daily nutrient needs. In addition, they recognize the small amount of added sugars in flavored milk is an acceptable trade-off for the nutrients provided. Flavored milk contributes just 3% of added sugars to kids’ diets. Sodas and fruit drinks, on the other hand, account for close to half of the added sugar, delivering much less, if any nutrition in the process (NHANES (2003- 2006), Ages 2-18 years). And best of all? Studies show that children who drink flavored milk meet more of their nutrient needs and do not consume more added sugars or fat than non-milk drinkers (Murphy MM, et al. J Am Diet Assoc. 2008;108: 631-639) and (Johnson RK, et al. J Am Diet Assoc. 2002;102:853-856). Your family needs to drink more milk! You simply can’t find a beverage that offers the same nutritional benefits as milk. Even if you need to purchase flavored milk, you are better off as your family will still consume the 9 essential nutrients inherent in milk than if you drank other nutrient-void drinks. Are your products hormone free? Yes, they absolutely are! In fact, our family dairy farmers have pledged to never use any added growth hormone such as rBST. That is a requirement of Arps to our family farmers, and is a part of a belief system we call Dairy With Integrity. Within this belief structure we source local from family dairy farmers who treat their animals with care and compassion, and do operate in the way that consumers deserve. To this point, we have a lot of information on our site to show transparency in every step of our supply chain. Feel free to check out our About Us section which covers more on the Dairy With Integrity belief as well as our Farm Practices section which describes in detail everything from animal care to quality to our sustainability efforts to ensure a healthy earth for generations to come.